Diseases are usually easiest to see and diagnose in the couple of weeks before swath timing. Patches of dying or prematurely-ripening plants are obvious areas to scout (and show up really well with drone images), but even clean-looking fields can provide some early warning if you take time to look. Gather up your scouting toolkit (including clippers and trowel) and head out to the fields. Use scouting results to plan rotations, choose varieties, and update fungicide decision-making for next year. 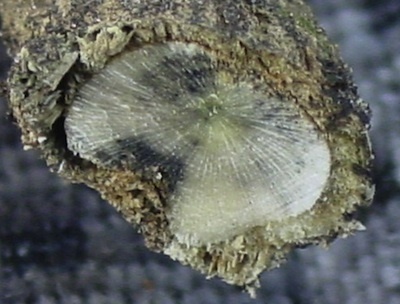 Sclerotinia stem rot. Look for areas with lodged or prematurely ripened plants. Brown or yellow plants scattered throughout your green crop may indicate a low level infection. 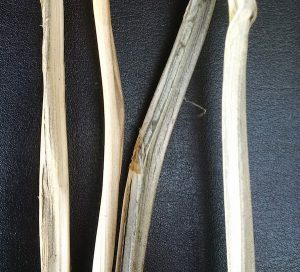 Sclerotinia stem rot is most damaging when stem infection is early, and severe to the point where whole plants die before seed matures. Examine the lower to middle areas of the stem looking for large bleached or tan lesions. In some cases, white fungal growth may appear on green stems. (You may find infection very low on the stem, often where infected leaves fell against stems at ground level.) As the infected stem dries, it will appear bleached or brown — like a bone — and may start to crack open or shred. Infected stem tissue is often hollow and hard, black sclerotia bodies — similar in appearance to mouse droppings — may be found inside the infected stems. 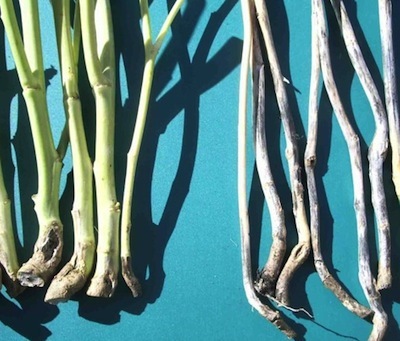 As a general rule, yield losses due to Sclerotinia stem rot will be approximately equivalent to 50% of the disease incidence. For example, if 10% of stems are infected, yield loss will be about half that — or 5%. Read more. Blackleg. Look for areas with lodged or prematurely ripened plants. Examine the bottom to middle areas of the stem for lesions. Black pepper-like specks (picnidia) may appear within the lesions. 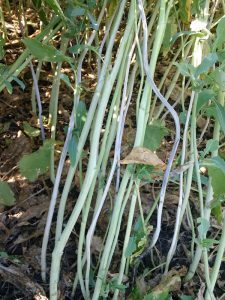 When blackleg is severe enough to cause yield loss, the plant will have irregular, knotty, woody cankers at the base of the stem. This infection will eventually grow through the stem, cutting off nutrient flow. If you see plants drying up, use garden clippers and slice through the stem at the base. 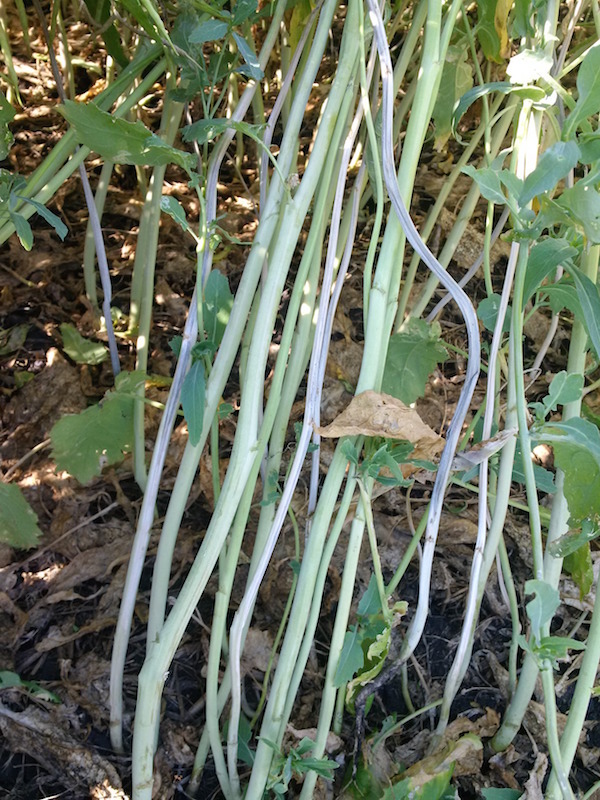 If more than half the area of the stem is blackened, blackleg has likely reduced the yield of that plant. 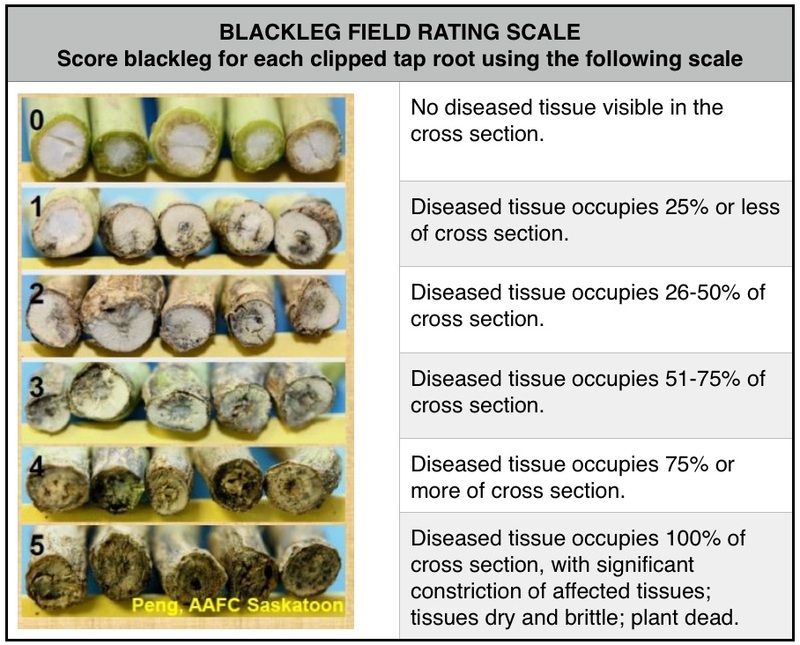 How to rate a crop for blackleg. If blackleg is higher than expected even with a fungicide, check notes to see the timing of the fungicide. To be effective, a fungicide labelled for blackleg should be applied at the 2- to 4-leaf stage of the crop with appropriate rate and water volume. 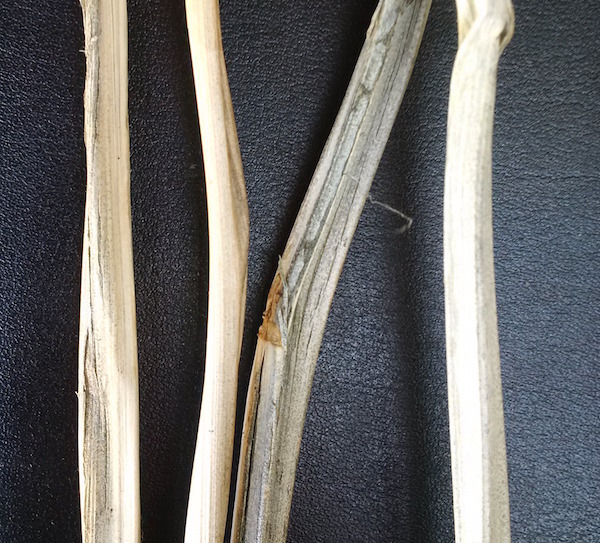 If seeing blackleg infection, consider changing to a different major resistance (R) gene. This tiny clubroot spore will have no effect on plant yield this year but will release spores for future infection. Clubroot. Above-ground symptoms, including wilting and pre-mature ripening, should be evident in severely-infected plants. 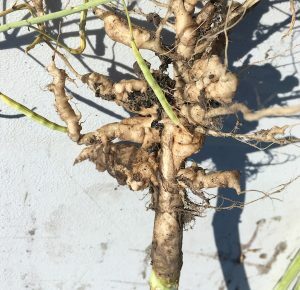 Plants may be infected with clubroot even if above ground symptoms are not present. 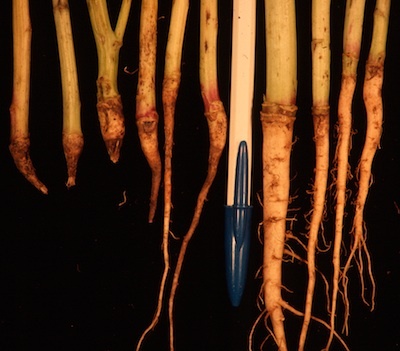 It is important to pull or dig up plant to examine the roots for clubroot galls. When scouting for clubroot it is important to examine the roots of plants at the field entrance, low spots or areas with premature ripening. Light or severe infection has essentially the same risk for spreading the disease with equipment. If galls are present, the best management at this stage is to prevent spread within the field, and certainly from field to field. Read more. 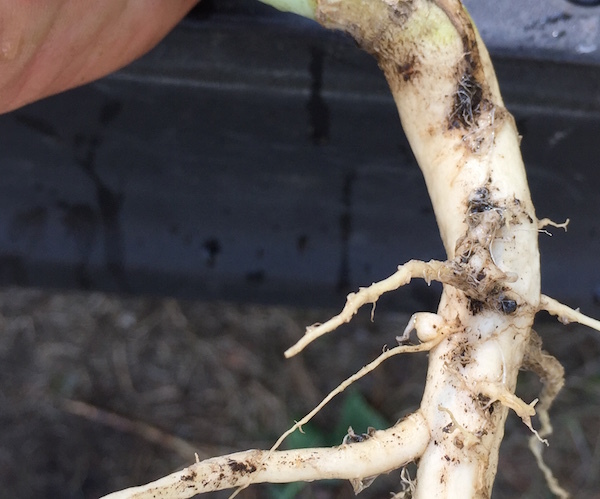 Small growths on roots might not be clubroot, but you can get these analyzed to make sure. Alternaria disease can cause pods to dry prematurely. Alternaria black spot. This is not usually an economic problem in B. napus (Argentine) canola when the crop is standing, but some superficial infection may turn swaths black as the crop turns colour and dies. Alternaria tends to be more damaging in juncea or rapa canola. In these crops, small black spots will move up the plant, eventually reaching the pods. 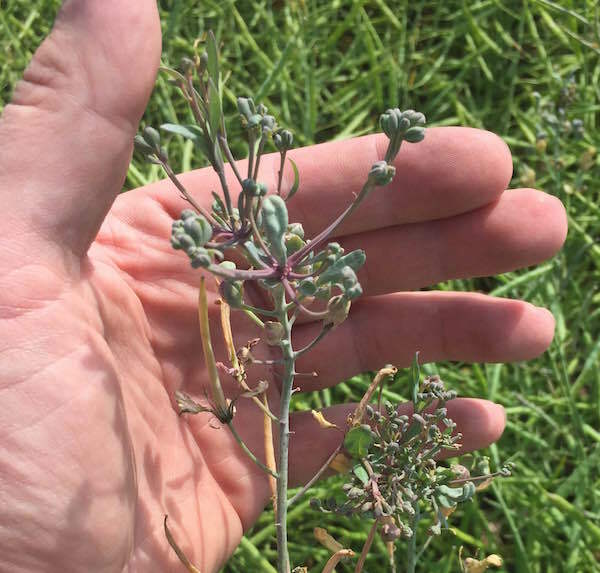 If alternaria is to show up in napus canola, it will be later in the season when weather and time have removed the protective wax covering on the plant. UV radiation, cool/warm fluctuations and hail will break down this wax barrier. Cool wet weather can also increase alternaria infection, and rain splash can spread the disease to other plants. 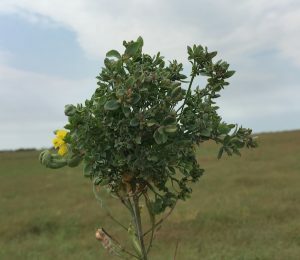 In cases of heavy alternaria infection (which is rare), early swathing may have an overall economic benefit to later swathing if alternaria has moved to pods. When infected areas make up 50% or more of the crop, swathing early may be the best way to salvage the yield in those infected plants. The disease can keep spreading on green material, and swathing hastens dry-down of the crop. Read more. Aster yellows. Common symptoms include the malformed bladder-like pods, which produce little to no yield. The disease can also result in normal looking pods that contain only a few misshapen seeds. Other symptoms include sprouting in the pod, and purplish plants and pods, although this purpling can result from many potential causes. Read more. Brown girdling root rot at its most severe will completely pinch off roots. The plant lodges and dies. Foot rot and brown girdling root rot. 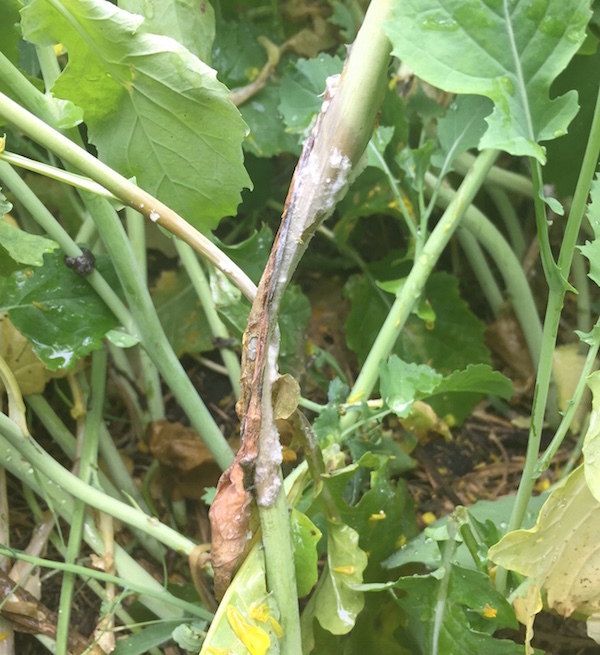 Canola plants exhibiting brown superficial symptoms at ground level likely have fusarium foot rot, which produces tan brown lesions with concentric markings. Another possibility affecting canola roots at adult stages is brown girdling root rot (BGRR), which is more of an issue in Polish canola. Symptoms of BGRR are rusty brown lesions on the canola tap root, which may girdle and pinch off the root if severe. These diseases can be much higher in tight canola rotations. Read more. Grey stem. Grey silvery to purplish patches develop on stem. These can cover whole stems and continue to spread in stubble as plants decompose. Grey stem usually infects too late to cause significant yield loss. 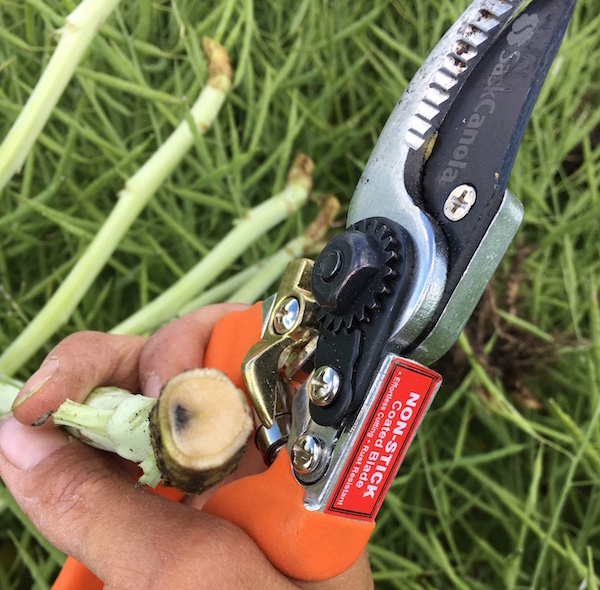 To differentiate blackleg and grey stem at the end of the season, cut the lower stem and look for dead blackened tissue in the crown — a characteristic of blackleg, not grey stem. Verticillium Disease symptoms in canola include leaf chlorosis, early ripening, stunting and as the disease progresses, necrosis and shredding of the stem tissue. Once the plant is fully ripe, the stem peels to reveal tiny black microsclerotia which resemble ground pepper in appearance. These microsclerotia remain on the plant stem or fall to the soil. While this may seem similar to the blackleg symptom, these specks are below the surface for verticillium stripe and always on the surface for blackleg. Read more. Check pods for exit holes from cabbage seedpod weevil larvae. If less than 25% of pods have exit holes, the spray could be considered a success. If less than 25% have exit holes and the crop was not sprayed, it was probably the correct decision. If more than 25% have exit holes and the crop was not sprayed, it probably should have been. Look for other insect damage to pods. Debarked pods (indicating bertha armyworm feeding), larger holes in pods (which could be from diamondback feeding or bertha armyworm feeding) and brown rotted seeds (which can result from lygus penetration of the pod). Crop maturity. Open up some pods and assess the degree of colour change. Look for root maggots while digging up roots. Their tunnelling can reduce root function (and yield) directly or can provide an entry point for root diseases that cause yield loss. Either way, severe root maggot can cause yield loss. 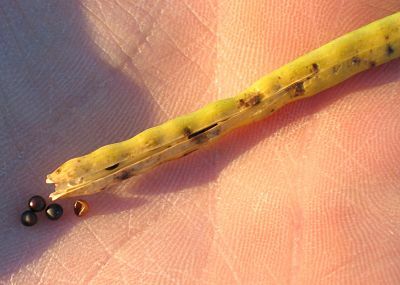 In these cases, growers can use crop rotation and higher seeding rates to reduce canola yield losses from root maggot. What draws in the flies to lay the eggs? Canola Disease Scouting – pre and post-swathing from Canola Council of Canada on Vimeo.